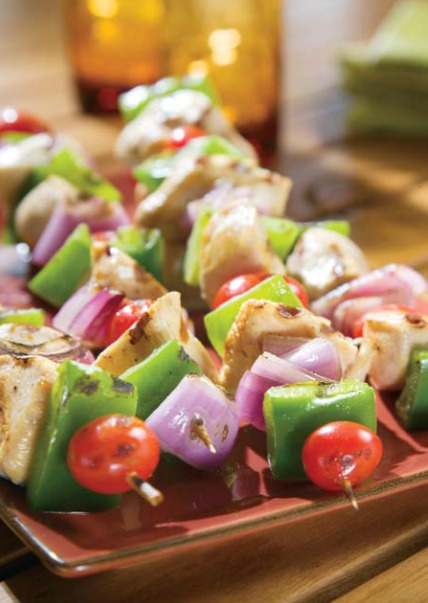 Try these kabobs at your next family barbecue. Makes 4 servings. 1 skewer per serving. In a small bowl, mix olive oil, lemon juice, and ground black pepper; pour over chicken and marinate one hour in the refrigerator. To make skewers, thread tomato, chicken, bay leaf, onion, and bell pepper; repeat. Grill over medium heat for 5 minutes on each side or until cooked through. Discard bay leaves before serving. Serve each kabob over ½ cup of brown rice.